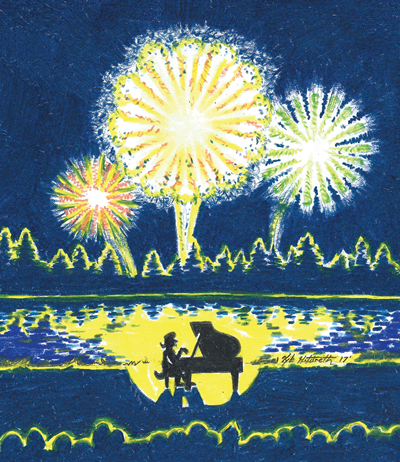 Orthodoxy isn’t the point when world-class performers play Mount Vernon’s Independence Day pops concert. How’d you first decide to do this? Here I was, taping shows all around the country, and I just said to myself, “This is crazy — my heart’s in Mount Vernon, and residents don’t get that kind of talent in town very often, so why not do this?” Now, it’s one of the things I’m most passionate about. It’s sort of the highlight of my year. Is it tough to get performers to come? No, the musicians love it. All I really have to do is make sure I get [violinist] Charles Yang or [bassist] Michael Thurber. At least one of them has come every year, and people are always asking, “Oh! Is Charles coming back? Is Mike coming back?” They have broad backgrounds and really engaging stage personalities. Plus, they’re extraordinary improvisers, going from, say, Bach to Michael Jackson without skipping a beat. The wonderful thing about the audience at Mount Vernon is that both pieces are accepted simply as great music. You have an eager audience. Definitely. It isn’t necessarily a sophisticated classical music scene — but the key is that sophisticated doesn’t really mean anything. It’s about what’s between your ears and in your heart. In some ways, the audience is more sophisticated than a typical classical crowd, because they’re open to hearing anything — classical and pop — and measuring it by its quality. Duke Ellington said there are only two kinds of music: good music and not-good music. I have very strong positive feelings about an audience that’s appreciative and open, with no snobbishness whatsoever. So you mostly draw from around Mount Vernon? The turnout is pretty local — maybe some people from Belgrade Lakes or Readfield, but not too far away. But I’ll tell you what, last year, I’d never seen so much traffic here. Afterward, it must have taken a good 20 minutes for all the cars to clear out. The more people that come, the better. The 7th annual concert starts at 7:30 p.m. on Sunday, July 2, at the Mount Vernon Community Center (2 Main St., Mount Vernon). Visit 30mileriver.org for tickets ($12 adult, $6 under-18).